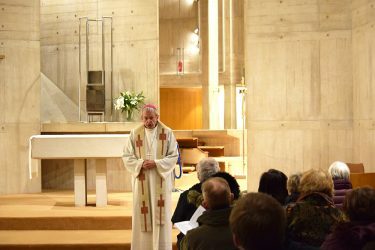 Almost 60 people gathered together at the cathedral on the evening of 30 January, in spite of the bitterly cold weather, to take part in the first session of the new Liturgy Course. This course has been created by the Diocesan Liturgy Office to complement our bishop’s Year of Prayer and to enable us to deepen our understanding of both liturgy and prayer, helping communities to see that these are not mutually exclusive, rather that they are intrinsically linked: the liturgy is always an encounter with the Risen Christ – it is always prayer. The sessions will be delivered by a number of excellent speakers, from both within and outside the diocese, who are each experienced practitioners in their particular field. This first session began with a celebration of Evening Prayer in the Blessed Sacrament chapel, presided over by Bishop Declan who, in his teaching, spoke to us of the need for liturgical formation and why this course, which comes at such an opportune time in our Year of Prayer, is so important. Our reading had been Genesis 18:1-15 which spoke of Abraham’s encounter with the three angels and Bishop Declan emphasised for us that the each of the sacraments was always an encounter with Christ. After Evening Prayer we went down to the Apostle Room for a cup of tea before listening to a wonderful talk by Gavin D’Costa, Professor in Catholic Theology at the University of Bristol. 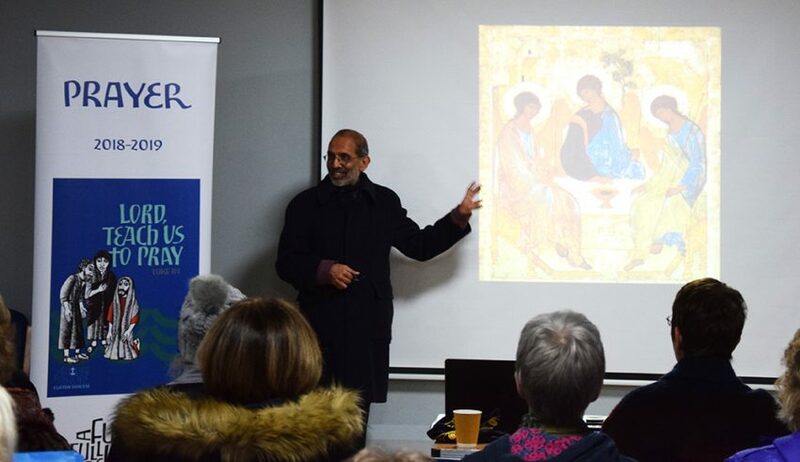 He, too, spoke of Abraham’s encounter with the angels, illustrated by Rublev’s beautiful icon ‘The Hospitality of Abraham’ (often referred to as the ‘Icon of the Trinity’). He explained its composition and talked of its meaning, encouraging us to pray with the icon – sitting, looking and gazing. This was a great start to the course and those who took part seemed to really enjoy it, not only voicing that but adding words such as ‘brilliant’ and ‘wonderful’ – our future speakers will have two excellent acts to follow!